GW has the exclusive on the former Ozzy guitarist's brand-new video. Watch it here. 'Patina,' the second album from the Jake E. Lee-led band, is out now. The band will hit the road in 2019 for a full U.S. tour. Jake E. Lee's Red Dragon Cartel Share Lyric Video for New Song, "Crooked Man"
The band's sophomore album, 'Patina,' is out November 9. Jake E. Lee's Red Dragon Cartel Premiere New Song, "Havana"
GW premieres the former Ozzy guitarist's first new song in four years. 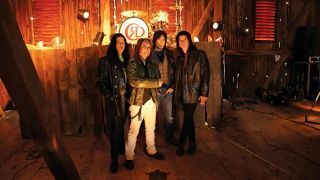 Jake E. Lee and Red Dragon Cartel Debut Music Videos for "Shout It Out" and "Deceived"
As you might've read in the February 2014 issue of Guitar World, Former Ozzy Osbourne and Badlands guitarist Jake E. Lee is back with a new band, Red Dragon Cartel. The Guitar World gang visited the Charvel booth at the 2014 Winter NAMM Show in Anaheim, California. As we first reported back in October, former Ozzy Osbourne and Badlands guitarist Jake E. Lee is in the midst of returning to active duty. There's been a rare sighting of elusive guitarist Jake E. Lee -- in a new music video from Beggars & Thieves.